Angkor Wat is a temple complex at Angkor, Cambodia, built for the king Suryavarman II in the early 12th century as his state temple and capital city. It is the world's largest religious building. 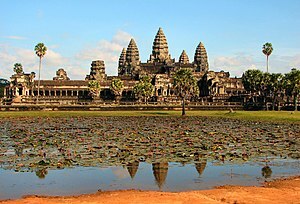 Angkor fell into decline after the 14th Century. ↑ "Angkor Temple Guide". Angkor Temple Guide. 2008. http://www.angkor-visit.com/angkor_wat.html. Retrieved October 31, 2010. This page was last changed on 26 February 2014, at 03:57.